Fifth Element recording artiste Richie Spice recently completed the shoot for his latest video, ‘Brown Skin’, from the VP Records album ‘In The Streets To Africa‘. Shot at the Brooklyn Daylight Studio in New York and directed by Nadia Simpson and Timothy Naylor, the theme of the video surrounds the Rastafarian singer serenading his brown skin girl, depicted in the video by at least six different beautiful brown skin ladies. …”brown skin, girl I want to wrap you, want to lock you in my arms again“…the lilting lovers’ rock ‘Brown Skin‘ has Richie’s rapturous vocals floating to falsetto heights over the gentle one drop riddim produced by the consistently chart-topping beat master Donovan ‘Don Corleon’ Bennett. Like Buju Banton’s ‘Love Mi Browning’ in the early 90s, ‘Brown Skin‘ has also engendered controversy rooted in its perceived preference for lighter skin shades. Spice’s explanation, however, dispels that erroneous notion. “People say I should have said black skin or white skin but nobody is black, man, and no one is white, we have brown skin people and chocolate skin people. The colour white is a totally different than what they call a white person. Look at a person who is black and look at a piece of black material and it is a totally different thing,” the singer said. 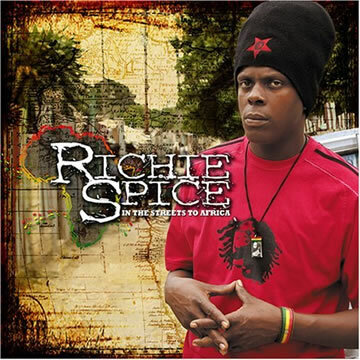 Fifth Element Records and VP Records will cooperatively release Spice’s album ‘In The Streets to Africa‘ on February 6. Wheatley feels the deal between 5th Element and VP Records is one of the most significant reggae partnerships undertaken in many years. ‘In The Streets to Africa‘ will undoubtedly rank as one of the finest releases of 2007 and in turn, will elevate roots reggae’s profile in America where it is superceded by dancehall’s commercial popularity.